A bendy tripod for any size phone, with the option of making it a phone stabilizer. The phone mount has two modes: Tripod and phone stabilizer. You could further remix this so that the base and connector pieces are used to mount other devices, like small videocameras. In the interest of universal printability, all parts are made to fit in a 100mm x 100mm x 100mm printer. Check the What to Print and Post-Printing tabs for printing, assembly, and use instructions. The tripod is designed to be flexible enough to use in any environment, to perfectly position your phone or small camera (This should be easy to modify to fit a GoPro, for example). 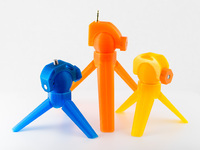 The tripod is remixed from giufini's PCB Workstation with Articulated Arms. I used the arms as the tripod legs, and changed the LED holder ending to a fully closed bulb shape for the foot. The stabilizer uses gravity and a simple gimbal system to keep your camera from shaking too much when you hold it and move, giving steadier video. The stabilizer is remixed from artobot's Crazy Simple Camera / Phone Stabilizer. I modified it to fit with the base of the tripod, reversed the pins and holes to make it more comfortable to hold without the rings, and made new handles with pegs to hold them in. While the legs of the tripod provide some weight, they are pretty light so I suggest adding more ballast for better performance. The feet of the tripod come in two variations. They can either be printed in one piece (and for this use solid would help) or in two, which allows them to be filled with another, heavier material. Video comparing footage with and without the stabilizer, using about 1/4 lb of weight underneath. You will need supports for the lips on the phone_mount_bottom and phone_base, though everything else should print fine. If you go for the single-part feet (tripod_foot_whole) it is a good idea to print it at 100% infill to add weight to the bottom, as it will help with stabilization. You will need two fairly small rubber bands. Loop one rubber band through each hole in tripod_phonemount_top and around itself, so that it is secure. Slide tripod_phonemount_top onto tripod_phonemount_bottom and pull the rubber band around the pegs. Once a phone is in, they should hold it tightly. Glue tripod_connector into the recess on the bottom of tripod_phonemount_bottom. I used superglue, and it holds fine. Put the three tripod_leg_keys into their holes in tripod_base or stabilizer_base (stabilizer_base is the same as tripod_base but has holes for the gimbal system). You may need to sand, as the tolerances are pretty tight. I suggest gluing these in place anyway. Snap the tripod_leg_joints on, and end each leg with a tripod_foot. Do not glue these. Slide the assembled phone mount into the base. Slide stablizer_inner_ring over stabilizer_base so that it clicks into place. Do the same with stabilizer_outer_ring. Connect the stabilizer_handles to stabilizer_outer_ring using the stabilizer_handle_pegs. I suggest not gluing these, so that you can take it apart for storage. However, it would add strength. (Optional) Add the stabilizer_extenders to the legs. The stabilizer should be taken off when not in use, as it gets in the way of the tripod. When putting it on, it is easiest to go from the top by sliding out the phone holder assembly. Add the stabilizer_extenders to make the legs longer and more efficient. Another way to add weight to the bottom of the tripod is to wrap the legs around something fairly heavy. 1x tripod_phonemount_bottom Print this part laying down, as it will be much stronger and smoother. The split one is for people who want to use a different material or color for the bottom of the foot, such as a more rubbery filament for grip. Also good for filling up with a heavier material to act as a weight for the stabilizer. Roughly 18-30x tripod_leg_joint, in multiples of 3. Printing more simply means longer legs.